At the end of December, the fates conspired against us and our furnace and our washing machine broke close to simultaneously. We live in Vermont, where it gets so cold (it is currently -25 degrees Fahrenheit) that some schools will close upon hearing the weather forecast (not ours, thank goodness!). Accordingly, our first priority was to ensure that our house had heat and hot water. I contrived to make the washer limp along until I reached the end of my patience with it. I was sure I’d make it a few months. The new one arrived today, in all its energy-efficient, front-loading glory. Next to the coffee maker, the washing machine is the most important appliance in our house. If I had to, I would hand-wash our dishes. But there’s no way in hell I’d hand-wash our clothes. After my husband came home, I encouraged the five of us to crowd around it like the proverbial golden calf. They oohed and ahhed for about five seconds before the boys lost interest and drifted away. “You may not EVER get inside this machine,” I said to Medium, who had stayed behind to watch me fold laundry. “And your brothers shouldn’t ever get inside it, either.” I added, thinking I was emphasizing my point. Sometimes I wonder just how much my children care for one another. I love those washers and dryers. I will never have another top loading machine. No more standing on tip toes to get things out of it. I’m just a little bit on the short side. Anyway congrats on the machine. Now to your statement about you aren’t sure how much kids really care about each other. Mine fought like cats and dogs, and I don’t think there wasn’t anything my daughter wouldn’t do, if her brother said do it. Since they are now grown I am hearing stories that causes my very straight hair to curl that nieither one bothered to share while they were at home. Which is a good thing. My children are as different as night and day and I think they put up with each other just because they are siblings. Ignorance is bliss and I’m glad I stay ignorant for a lot of years. I said all that just to say, I’m not sure either how much they, but they will always be connected in some way. Thanks for your comment! Some people say “You can pick your friends but you can’t pick your family.” I disagree. We all have the opportunity to create the families we want and although the blood bond can be strong, the bond of shared experiences can be just as strong, if not stronger. That said, my sister came over the other day and we were reminiscing about our childhood. I said something and she responded, “Did we grow up in the same house?” I hope my kids will love each other into adult-hood. But if not, there will always be those hair-curling stories for them to fall back on! *snort* Too funny! I also read your Mad Mom post and I was ROFL. Just stopping by from Freshly Pressed… congrats btw. I had gotten my 15 minutes of fame a couple of months ago and it was so much fun! Glad you found me! Thanks for the congrats and thanks for clicking through to read other posts. Love Freshly Pressed and have become a devout follower. Was a little sad to see my stats decline after getting bumped from the WP frontpage; there is no denying it: the power of the Press is phenemonal! Looking forward to checking out your blog too! Very funny:) My kids say things like that all the time. Don’t you just want to peek inside their little brains sometimes? Stuff like this is exactly why I started blogging. I didn’t want to forget all the little things. 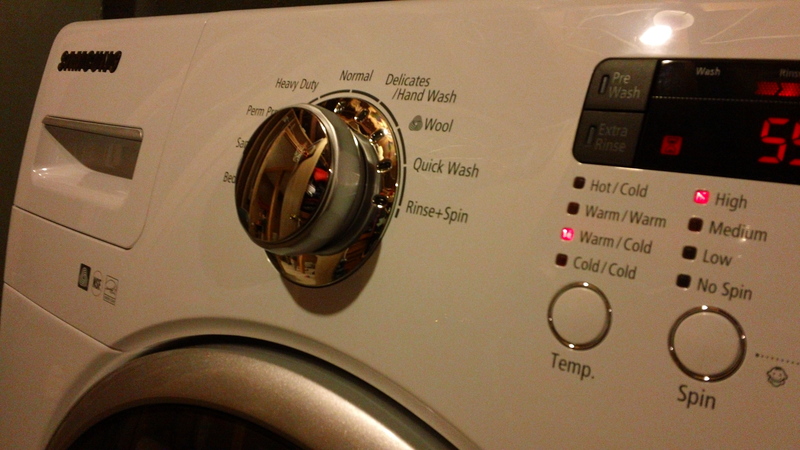 The new washer is a plus – it was worth the expense (although I didn’t have a choice! ).